Benjamin Mendy and Bernardo Silva both make their first starts against Bournemouth. SERGIO AGUERO HAS been benched by Manchester City for their trip to Bournemouth. 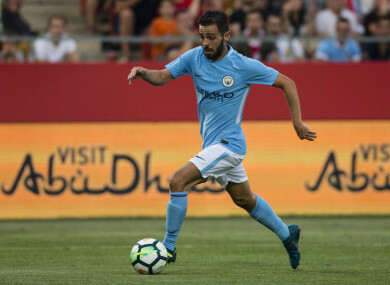 Raheem Sterling and Bernardo Silva, meanwhile, have been handed their first Premier League starts of the season. Elsewhere, Danilo has been shifted to a right-back berth to cover the absence of Kyle Walker through suspension while Benjamin Mendy comes in for his debut. Pep Guardiola admitted after Monday’s 1-1 draw with Everton that he was “concerned” by a lack of firepower from Aguero and Gabriel Jesus, and he has now acted accordingly. The Catalan coach said: ”I’m concerned. We have guys who can score goals. I never will doubt Sergio and Gabriel. Even Kevin De Bruyne is a guy who can score 12 to 15 goals. Last season he made 21, I think. “But you see the Everton game, 11 against 10 for more than 50 minutes; you saw how many chances we created against one of the best defensive teams. City will be going in search of their second way win of the season at the Vitality Stadium. They opened the 2017-18 campaign with a 2-0 victory over Brighton, before being held by Everton at the Etihad. Email “Aguero left out as Man City hand full debuts to two big-money summer signings”. Feedback on “Aguero left out as Man City hand full debuts to two big-money summer signings”.